I have looked through a lot of the data I can get from WMIC, and while I can find a lot of network adapter information I'm not able to find exactly what I'm looking for. Is anyone aware of a way to get this information from the regular Windows command line without using third-party utilities? 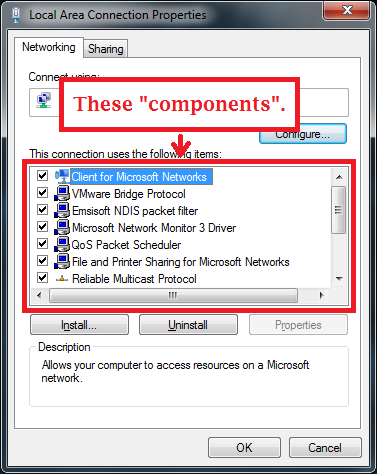 How do I get a list of the components used by each network adapter on the system. You can use nvspbind (a Microsoft Technet application) to retrieve exactly the information you are asking for. nvspbind is a tool for modifying network bindings from the command line. It is especially useful in Server Core environments with the Hyper-V role enabled. Microsoft_Nvspbind_package.EXE is the standard 64 bit version for server core. 32bit_Nvspbind_package.EXE is a 32 bit version that works on Vista and newer. XP_Nvspbind_package.EXE is a reduced functionality 32 bit version that works on XP and newer. Hyper-V Network VSP Bind Application 6.1.7725.0. "Remote NDIS based Internet Sharing Device"
As an update, and to provide an example for anyone else who may need to know this, I wanted to post that I've found a way to take the suggestion given by DavidPostill by downloading NVSPBind with BITSAdmin (BITS Administration Utility). Apparently BITSAdmin was never removed from Windows (it is still in Windows 10, and still performs this function as expected). BITSADMIN.EXE /TRANSFER "NVSPBind" /DOWNLOAD /PRIORITY FOREGROUND "https://gallery.technet.microsoft.com/Hyper-V-Network-VSP-Bind-cf937850/file/117119/1/32bit_Nvspbind_package.EXE" "%TEMP%\NVSPBind\32bit_Nvspbind_package.exe"
"Intel(R) PRO/1000 MT Network Connection"
Not the answer you're looking for? Browse other questions tagged windows networking command-line batch network-adapter or ask your own question.